The NVIDIA SHIELD Android TV has rather rich gaming capabilities. It supports a library of Android games compatible with its gamepad. It also supports GameStream technology, which allows for games to be streamed from a suitably equipped GeForce GTX PC. Besides, it supports the GeForce Now subscription service, which can stream new games rendered in NVIDIA’s datacenters to the console. In addition to games, NVIDIA has also been serious about enabling access to other types of content, including movies, music, sports and news. 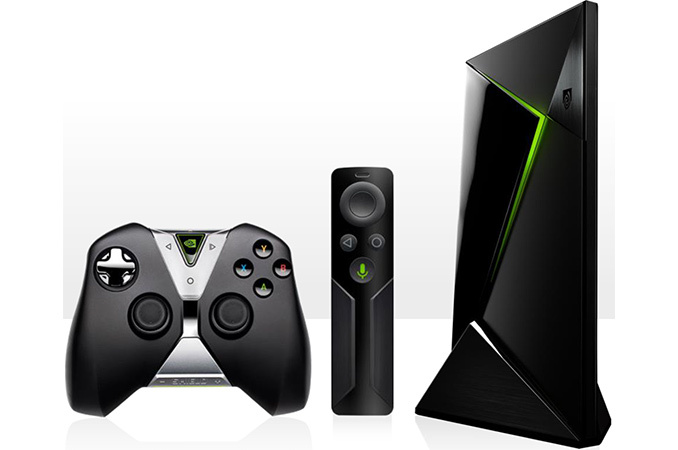 At its launch a year ago, the NVIDIA SHIELD Android TV supported various video streaming services. The most popular among them included Netflix, YouTube, Hulu Plus and Vevo. However, certain services such as Vudu were notably absent. 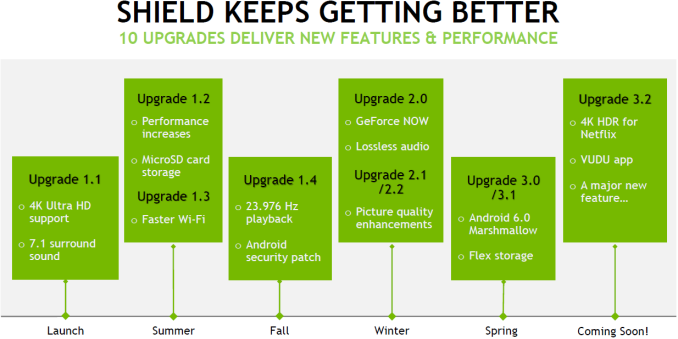 At the Google I/O conference today, NVIDIA announced that its upcoming Upgrade 3.2 for the SHIELD Android TV will bring support for new content providers, including ABC, Vudu, Spotify, MTV and Disney. The Vudu content delivery application for Google’s Android TV will support streaming of ultra-high-definition 4K movies, adding another option for premium TV owners. In addition to UHD video, Vudu promises to support Dolby Atmos surround sound audio. Dolby Atmos is a nice addition to SHIELD’s lossless audio support. The Vudu Android TV app will be an exclusive on the SHIELD Android TV for some time to come. Owners of the device will be able to acquire 4K content from more than six providers, including Netflix, Hulu, HBO Go, Vudu, Plex, UltraFlix and Curiosity Stream. While Vudu is a new addition to the NVIDIA SHIELD Android TV, the Netflix app is also receiving improvements. With Upgrade 3.2, SHIELD Android TV owners can now play back select 4K titles with HDR (high dynamic range). From a technical standpoint, HDR-mastered 4K video streams contain special metadata flags that help HDMI 2.0a-supporting hardware to display scenes with 10-bit color depth and a greater color gamut properly. We already saw in our review that Netflix streams HEVC 10-bit video for some of the 4K titles, though all 10-bit videos are not necessarily HDR-enabled. HDR support will not be limited only to Netflix. NVIDIA also plans to add HDR streaming to its GameStream technology later this summer. Encoding of HDR-enabled streams will only be available on GeForce GTX graphics cards based on the company’s latest Pascal architecture. This is not really surprising as the GP104 is currently the only GPU in NVIDIA’s arsenal with the hardware-accelerated 10b encoding necessary for HDR with good quality. Although the SHIELD Android TV was the industry’s first Android TV STB capable of decoding and displaying 4Kp60 (3840x2160 resolution at 60 fps) content, users were limited to local content in order to experience it. This will be changing shortly, as YouTube will soon make 4Kp60 content available on the STB. While NVIDIA has not revealed everything that is set to come to the SHIELD Android TV in the next few months, it did confirm that the STB will definitely get an upgrade to the next-generation Android N. The future Android TV operating system will support features such as live TV recording, picture-in-picture and so on. Given the fact that NVIDIA has been updating its SHIELD set-top-box regularly in the past year, it is likely that the company will upgrade it to the new Android TV version once the latter is released. While NVIDIA is making the SHIELD Android TV better for existing users, the company is also working to expand its customer base. For a limited time only, it will bundle the SHIELD Remote ($49.99) for free along with the SHIELD 16 GB ($199.99) and the SHIELD Pro 500 GB ($299.99) set-top-boxes. If it was going to be sold in Europe, with the USD to EUR conversion, and then adding the VAT, it would be a lot more expensive. There is no M2 or SATA port. The pins exist on the motherboard, but you would need to solder connectors to them.